The Donald never sleeps. 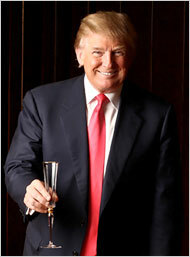 In the midst of his yet unofficially announced presidency run—he is a close second after Mitt Romney in the most recent polls—, his political appearances (Tea Party rally in Florida next week), his celebrity firing on The Celebrity Apprentice, he has the time to buy a winery (from my colleague at C-VILLE Weekly). For $6.2 million, Trump got almost all of what he wanted: 700 pristine acres in Albemarle County, the winery, and, most importantly, the labels and trademarks of Kluge Estate Winery & Vineyard, once owned by Patricia Kluge and husband William Moses and most recently bought back by the financing bank in a foreclosure sale. Things are tough out there…except for Mr. Trump. And there is more: Trump reportedly wants Kluge’s former residence, the palatial Albemarle House, once on the market for $100 million and now also in the hands of the bank. With 45 rooms, a theater and a perfectly sculpted landscape, it may just be Trump’s perfect country home away from his …. other homes.